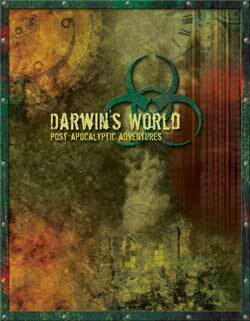 Darwins World 2nd Edition is a revised and expanded version of the GenCon/Ennie award nominated post-apocalyptic d20 RPG. All the new rules are revised for compatibility with the modern d20 System. This new edition is focused on separating the mechanics from the setting, making Darwins World the definitive guide to building post-apocalyptic campaigns, whether you are playing in the Twisted Earth or your own preferred post-Fall setting. The Campaign Guide is Book II of Darwin's World 2. For the complete overview, check out the the Darwin's World 2 Homepage. Campaign models, setting ideas, environmental dangers, as well as other topics related to post-apocalyptic gamemastering. An outlining of the major adventure locations of post-apocalyptic games: wasteland settlements, trade towns, cities of survivors, vaults, necropoli. Each with an example. The Denizens of Twisted Earth Details on the major factions of the Twisted Earth, including statistic blocks for typical members.